An envelope of gruesome photos. A killer with a design. Can he be stopped in time? 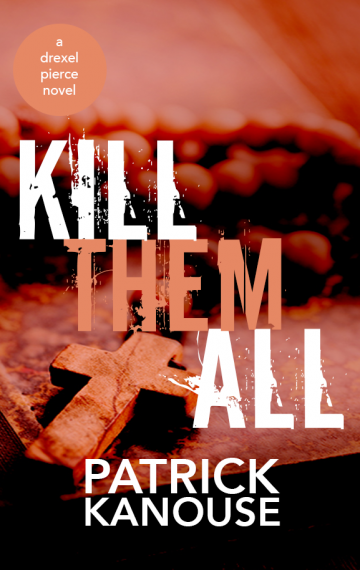 Kill Them All is the second book in the Drexel Pierce mystery series set in modern Chicago with compelling characters and twists and turns. Fans of Michael Connelly, Ian Rankin, and Ross Macdonald will love the second installment to this mystery series. Detective Sergeant Drexel Pierce split the blinds with his fingers and looked down onto Congress Parkway. The late morning traffic was heavy with commuters pouring into the Loop, driving east into a blinding sun a quarter way up the sky. Behind him the handcuff chain rattled against the table. He turned to face Lester Hawkins, who crouched halfway between sitting and standing. Dark gray dominated Lester’s cumbrous hair and full beard. A long-ago broken nose curved left. He wore torn, oversized jeans and a Nike T-shirt with a University of Chicago sweatshirt over that. He smelled—if one were charitable—rank. A combination of body odor, onions, gasoline, and old, wet cardboard. Both men wanted out of the makeshift interview room in the Dearborn station, a putative temporary location while the Chicago PD renovated the Central Division’s Wentworth station. Drexel to escape the smell. Lester to avoid being questioned by the police and return to the streets that were his home. “Sit down.” Drexel twisted his lower lip, sighed, and walked back to the desk in the middle of the bland, off-white room. Lester looked at him and sat down, shaking his head the entire time. “Why are you here?” asked Drexel. Lester stopped shaking his head and stared at the desk. “Come on, man. I need to hear your story.” Drexel dropped his head and looked at Lester, but the man refused to return the look. Drexel opened the gray folder next to him, which contained a printed copy of Lester’s rap sheet and the arresting officer’s report. He skimmed the sheet, which was filled with minor arrests for suspended licenses, shoplifting, and vagrancy. Nothing violent, but no saint either. He could not blame the man for pilfering necessities here and there. Patrol officers Matt Bergenson and Ayeesha Jenkins had picked up Lester as part of Drexel’s investigation into the murder of James Praxton, street name Kid Dunkadelic, of the Vice Lords. The detective had sought patrol’s help in stopping and talking to any vagrants in the area of Eighteenth and Ridgeway because an anonymous tip had suggested a number of homeless may have been in the area at the time of the shooting. Bergenson and Jenkins had stopped by a shelter, and as they asked questions, Lester ran. They had caught him and brought him here. “Coffee.” The word cracked as if it were the first word he had spoken all morning, which it may have been. Drexel stood up and started out the door. Drexel nodded and closed the door behind him. The detectives of Central Division occupied half of the third floor. All but the captain had desks in the open, which they shared with opposite-shift detectives. Along the walls, stacks of poor boys—accordion file folders with lids and string tie-downs—rose to nearly the ceiling, a constant reminder of the active or soon to be cold cases the homicide division worked. Natalie Connor sat at her desk and looked up at him before returning to her computer screen, a miniature version of it reflected in her rectangular-framed glasses. He walked over to his desk and sat down and breathed in the—by comparison—fresh air of the station. He looked to his right and into the face of James Praxton staring out at him from a photo on the whiteboard. It was a photo his mother had given Drexel, asking him to find the killer of the twelve-year-old boy wearing a Superman shirt and not the seventeen-year-old gangster. The edge where the mother had gripped the photo as she handed it to Drexel was bent. So much had gone wrong in the past five years of her son’s life, not the least of which was the violent end. Praxton as he exited an alley had been gunned down from a passing car. Four bullets to the chest and thigh. He died in the hospital two days later, never having recovered consciousness but with his mother and sister by his side. After looking at the photo of the younger Praxton beside the crime scene photos showing pools of blood on the street, evidence markers, and a close up of the lone shell casing, Drexel walked to the kitchenette, grabbed a Styrofoam cup and filled it with coffee. He added a packet of sugar and a packet of creamer. He then filled a mug with the Chicago PD logo on it and added three sugars to it. And so the questioning continued with Lester offering brief, vague answers that forced Drexel to ask even more directed questions. He pulled out of Lester that the vehicle had been a four-door, American car from the seventies. Dark blue probably. The hubcaps were chrome spokes with a gold center. Lester said he heard a car pull up. He thought the victim was on the phone because he heard him talking to someone. This corresponded to the Praxton’s call logs, which revealed Praxton was talking to his girlfriend, Angela Farner, at the time of the shooting. Lester heard a car roll by, several shots—he did not know if there were six or ten or more—and then the car pulling away, but not fast. The CSIs had estimated at least a dozen shots because they had recovered that many bullets from the victim’s body, sidewalk, building facade, and trees. The killer or killers had emptied a clip into the kid. He had really wanted him dead. Drexel gave Lester another coffee and a Snickers before escorting him out of the station, where he gave him ten dollars and told him to be safe. He watched Lester turn the corner at Congress and disappear out of sight. Drexel sat at his desk and began typing out his report of the Lester interview. The details he had been able to provide did not assist the case. The vehicle description was too vague despite some details. Another witness a block down from the crime scene had described a mid-eighties Lincoln Town Car driving by. Not a surprising contradiction given it was eyewitness testimony and the shooting took place at night. Drexel rubbed his two-day growth of beard and looked back at Praxton’s photo. He shook his head clear and looked back at the in-progress report. The Lincoln Town Car had already been submitted to the Gang Unit for evaluation. He submitted what he had for the car Lester described, as well. Perhaps he would get lucky and the Gang Unit would have some description of a car by a rival gang, which was Drexel’s leading theory at the moment: Praxton was the victim in a fight between the Vice Lords and any number of their rivals. Natalie interrupted the writing, recommending they grab lunch. His stomach growled at the thought, so they spent an hour at Fat Dave’s Tavern, a half-block from the station. A favorite of the Homicide Unit, Drexel did not often eat there, preferring the sushi at Osaka Express or Charlie’s, a sandwich shop that had somehow evaded the knowledge of the unit. Not that Fat Dave’s food was not good, for it was. Instead of the normal Chicago dog, he went for the Italian beef. While they waited for their food, the waiter set their drinks—iced tea for Drexel and water with a lime for Natalie—on coasters. Natalie played with the edges of the coaster and fidgeted with her dark brown hair, shoving it behind her ear. Not too long after sitting down, Drexel realized that she wanted to talk about something, so he let her build up to whatever she wanted to discuss. She was the most junior homicide detective in Central Division, and he got along with her, unlike his more testy relationship with Martin Doggett, the unofficial hazer of the department, who had tormented Drexel years ago with pointless errands. Natalie had taken the hazing much more in stride. Doggett had walked over so often demanding a quarter, she had finally filled up an empty mug with them and kept it in her desk. Eventually, she spoke, and it turned out she wanted his advice on transferring out of homicide. She and her husband were divorcing, and the hours of being a homicide detective in Chicago did not conform well to the needs of her eight-year-old son. Drexel did not have much to say to her other than that Captain Victor Macleod, Natalie’s and Drexel’s boss, would be supportive and assist her. But he cautioned her that getting back into the unit may not be so easy. She frowned and nodded. Back at the station, he sat down at his desk and looked at the digital frame, which he stored overnight in the bottom right drawer. Photos of his wife, Zora—murdered now two and a half years ago—flicked by, changing every minute. He knew these photos well. Both of them at Grant Park. A selfie on the Navy Pier Ferris wheel, nighttime Lake Michigan dotted with lighted boats behind them. At a Cubs game wearing her white ball cap. He looked at the Sammy Sosa-autographed baseball in its plastic cube and hoped to get to Wrigley for a game soon. A new manager and some trades in the off season gave him—and others—hope for this season, which the Cubs would assuredly dash in typical fashion. Over lunch, mail had been dropped off at his desk, which contained several department memos, including an invitation to try out for the police department’s baseball club. A large manila envelope, ten by thirteen, addressed just to homicide, but with no return address, sat under the memos. Packing tape secured the seal along with the double-prong metal clasp. Doggett slapped him on the back as he walked past toward the elevators. “Have it, my boy. I told them to drop that on your desk, sucker.” Despite his large frame, the lieutenant walked fast, often sending loose paper fluttering off desks in his wake, and he was around the corner jabbing the elevator down button before Drexel could respond. He held the envelope. Light and pristine. “Do Not Bend” was stamped in red letters three times each on the front and back. Several Forever stamps—part of the Statue of Liberty’s head with wording along her left edge and the date 2011—but no postmark. As the elevator dinged its arrival, Drexel pulled on the packing tape, ripping the envelope. The glue seal had not been used. He slid out the contents. The first eight-by-ten photo was peculiar, and Drexel did not understand what he was looking at until he got to the second. In the first, a young woman—dark hair cut chin-length and straight, wearing a bright blue sweater over a T-shirt and dark blue jeans—stood before a nondescript background. A wall painted an eggshell white with no decoration. The woman was captured from head to toe. The look in her eyes, however, is what caught his attention and why his initial reaction was unable to conform the rest of the image. The look in her eyes was terror. He looked more closely. She was crying. Her right foot was supporting her weight as she retreated while her left arm was thrust out in a pleading gesture. When he slid the first photo away and saw the second, he called the CSIs.